Jul. 10, 2014 4:00 p.m. There was something for everyone in Wetaskiwin on July 1st, Canada Day 2014. The day began with the local Lions Club hosting a pancake breakfast at the Royal Canadian Legion from 8:30 to 10:30 am. 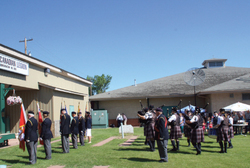 The large crowd that remained in the Legion courtyard anticipating the 11 am Canada Day ceremony were not disappointed. Comrade Barry Hawkes, MC for Canada Day, opened the ceremony by announcing the presentation of the colors by Legion members who were accompanied by the Ben Nevis Pipe Band decked out in eye catching tartan kilts, vests, white shirts and bright blue ties, knee high socks, and other Scottish accessories. Following the singing of O Canada, led by the WCHS choir, the Band entertained the crowd with a performance that never fails to stir the audience in a manner that only Scottish pipes and drums can achieve. City of Wetaskiwin Mayor Bill Elliot and County of Wetaskiwin Reeve, Cathy Rooyakkers brought greetings. Both stressed the importance of being a Canadian citizen by remarking on how emotional it was to observe forty-one people becoming newly appointed Canadian citizens on June 6th, 2014 during a Citizenship Ceremony at Reynolds-Alberta Museum. They commented that the new citizens had a humble understanding of the importance of what it takes and what is required to become a citizen of Canada. They noted each-and-every one of them exhibited pride of achieving the new official status as Canadian citizens and each and every one of them cherished this earned privilege. The activities did not stop there for the people of Wetaskiwin. Following the ceremony, some people dispersed to other venues throughout the community. The Legion Entertainment Stage and Concession and face painting booth were active until closing time at 5:00 pm. Tea & Pastries were served and Dining in the Café car Val David at the Alberta Central Railway. The Heritage Museum hosted Contests & Prize Wheel, Caricature/Historic Display, The Great Scavenger Hunt, Pioneer Photo Booth and free Canada Day Cake. The Fire Department hosted a display in the TD Bank parking lot, and 50th Avenue between 50 & 51 Street of Main Street was closed to vehicle traffic to host the Downtown Farmer’s Market. The day concluded with a fireworks display at Reynolds-Alberta Museum.